Most any Ethiopian coffee is known to have a fruity flavor, which might be the reason why some of us enjoy drinking it during the warmer months of the year. You know, fruit. Warmth. Hey, makes sense to me. DOMA's Ethiopia Sidamo -- Sidamo being the province in Ethiopia where this single origin comes from -- is what one might call bold. I'm sure you could call it many other things too, but as full-bodied as this is, I think "bold" kinda fits. There's a lot going on here, and you'd almost think the beans had been injected with blueberry juice. Really, just give them a whiff and it's hard not to notice the scent of blueberries. That berry flavor makes this very drinkable, particularly when paired with the more citric notes toward the end, with strong hints of lemon. Very refreshing, and flanked by some mild spices too, kind of just to keep you on your toes. This Sidamo truly is bold and smooth. This is the type of coffee people should gather around, to hug things out. Consider this one of our favorites over the past few months. 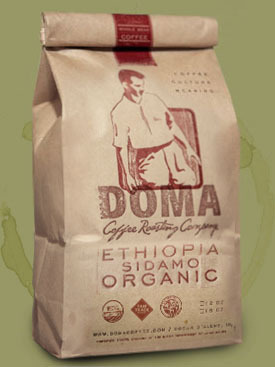 Do you recommend DOMA Ethiopia Sidamo Organic? Make your voice heard!